If your home isn’t energy efficient and properly insulated you could be wasting a lot of energy and a lot of money. For example in a home which has no or poor insulation around 60% of the heat will be lost through the walls and roof! There are many simple yet effective ways to insulate your home, which can significantly reduce heat loss while lowering your heating bills. In a house which has no or poor insulation the biggest heat loss, around a third, will be through the walls – thats why wall insulation (whether you have solid or cavity walls) can make such a difference. Un-insulated cavities can add up to 25 per cent onto your heating bill. Installing cavity wall insulation is a relatively simple process that can take just a couple of hours for a typical three-bedroom house. The insulation is blown into the cavity from the outside and disruption to the householder is minimal. *Costs may vary significantly depending on level of work required. You might be able to reduce these costs by carrying out the work at the same time as other home improvements or by not tackling all the house at once. Unlike cavity walls solid walls do not have a gap which can be filled with insulation. Solid walls let through twice as much heat as cavity walls do! That is why solid walls insulation can help you reduce significantly your energy bills. Solid walls can insulated from the inside or from the outside of your house, and often its best (to keep the cost down) to do this when you are getting other work done. filled with mineral wool fibre. Reduces the floor area of the rooms in which it is applied (the thickness of the insulation is around 100mm, is disruptive to the household, makes it hard to fix heavy things to the walls. 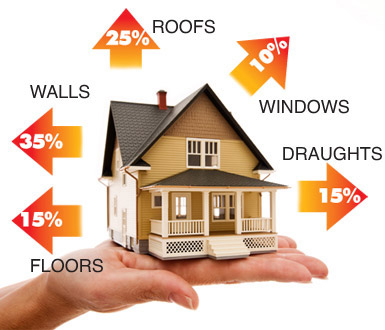 Heat rises, and in an uninsulated home, 25% of heat is lost through the roof. Insulating your loft, attic or flat roof is a simple and effective way to reduce heat loss and reduce your heating bills. Loft insulation is easy to install – you can even do it yourself. Even if you already have loft insulation, check its thickness. Adding another layer to bring it up to the recommended 270 mm will save energy and money. Floor insulation works through filling the gaps between the skirting board and the floor. It can reduce the heat loss by 10%-15%. Many homes – especially newer ones – will have a ground floor made of solid concrete. This can be insulated when it needs to be replaced, or can have rigid insulation laid on top. Draught-proofing is one of the cheapest and most efficient ways to save energy – and money. The main places to draught-proof are your floors, windows, doors and chimney and all can be done for a relatively low price. Doing the entire home can cost around £120 to £150, but can save you up to £65 a year on energy. To draught-proof your home you should block up unwanted gaps that let cold air in and warm air out. Lagging water tanks and pipes and insulating behind radiators reduces the amount of heat lost, so you spend less money heating water up, and hot water stays hotter for longer. Insulating your hot water cylinder (to 75mm) is an easy way to save money. This could save you around £25-£35 a year, so with the cost of a jacket round £15 it pays for itself in less than a year. Radiator reflector panels are a low-cost option. Fixed behind your radiators, they reflect heat from the radiator back into the room, instead of letting the heat out through an external wall. All homes lose heat through their windows. But energy-efficient glazing keeps your home warmer and quieter as well as reducing your energy bills. The disadvantage is the cost of replacing all the widows in your home. The costs and savings will be different for each home and each window but could save you around £200 per year. Double glazing should last for 20 years or more. Old boilers are poor for energy efficiency, oid oil boilers can sometimes be only 60% efficient. Modern boilers are required to be energy efficient, so therefore putting in a new boiler could be a wise investment. Use the Power to Switch comparison to see how much you could save by moving from an old oil boiler to a new oil boiler or as part of switching from oil to gas.